Ok, a suggestion was made to me at work that I'd like to hear opinions about. Right now, this beta test is looking to cost me a fair bit of money to get the first units produced. I'm happy to shell out the cash because I think it's vital to the development to get user experience and see what needs to be changed, if anything. However, this will stretch my own finances a bit when I should be paying bills. Some of you have already offered to preorder the kits to help support the development, something that was extremely gratifying, but I didn't feel comfortable taking anyone's money until I had made it a bit farther. I've said in the beta applications that the boards would need to be returned at some point, mainly due to the cost for me, however I would like to do at this point is offer a compromise. What I'd like to do is put up a small indiegogo campaign to cover the cost of production for 20 beta kits. 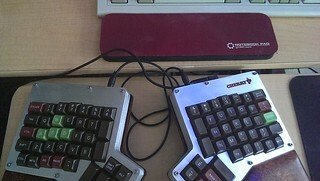 These kits will be offered with & without switches, and each kit would come with frosted keycaps for the backlighting. Basically, I'm looking at roughly $100 without switches, and $150 w/ blue, clear or black switches. This means that the prototype is yours to keep, and you'll still be able to buy a kickstarter/retail kit @ cost when they become available. I'm also looking at offering 20-30 sets of the clear frosted keys (in DSA) as well for $40 to help with funding as well. Would anyone be interested in this option? Sorry if it's posted elsewhere in the thread but what all is there required for assembly of the kit? Diodes, resistors, switches? I think that is an excellent idea. As someone who is not getting a beta (Exhausted all money on Ergodox), I obviously don't really get a say, but if I were signing up, I would certainly be OK with this idea. Case assembly & switches, everything else is surface mount or will be presoldered for you to aid in the simplicity of putting it together. For $100? Are you trying to go broke? Haha depending on when you want to start the beta I am VERY interested. Remember that this is for the unit @ cost for a beta, I'm not looking to make any money at this point, just fund the development so I can still afford to eat. The actual retail kit will price higher so that I'm not just giving them away lol. Timing wise, I'll probably start it at the beginning of August for 2-4 weeks depending on the response. I would actually prefer to be able to keep the prototype by funding it directly actually - since shipping back and forth isn't particularly convenient in my case (not to mention the shipping is pretty much half the cost of one board). But it all depends on how far along the keyboard is - is it ready in your opinion? how functional would the beta kits be in comparison to the final kits in your vision of the product? - reprogrammability - how will it be handled? Is there going to be a downloadable application/web interface? Or for that matter, are there any major features that's still omitted in the current boards? If the keyboard is at a stage where you find your original feature list satisfied, ie. a completed production model, and simply require end user testing for comments/further modifications, I'd be more than happy to pay for a beta unit and give feedback where relevant, rather than having you come out of pocket to provide the kits and pay for shipping two ways (after all, stuff costs money ). Would anyone be interested in this option? Right now unless there's a good reason to make a major board revision, the PCBs I have designed right now are what I would consider my production design. Same goes for the case. As for the firmware, the main controllers will run a bootloader enabling easy updates over USB. I'm also looking at whether I can build the main controller to also act as an ISP for the sub boards since the ATTINY isn't wired to the USB in any form. If for some reason it doesn't work out, I'll be including a usbtinyisp w/ each kit so that testers can update to the latest firmware as it's updated. For the updating & layout software, I've been working on an app to facilitate making updates easy and for programming layouts, as with the firmware these will be in flux, a big part of that is working it out so that it's cross platform compatible. In other words, I believe I can nail down just about all the base functionality by the time I have everything ready for the beta kits to go out. As an alternate approach; why don't we just give you money to reserve one of the first production units? I don't mind if I'm not on the list of beta testers, but I'd be willing to send you funds in order to reserve one once they go to production. Thats pretty much what you'd be doing w/ the indiegogo proto units, because the protos I have designed are pretty much the production run, the only difference will be the firmware. Also, buying a beta unit puts you on the list of testers automatically. The application process for beta was meant to help me reduce the risk with the cash involved with producing prototypes, however by purchasing a prototype unit you've negated that concern, and really you wouldn't even have to provide feedback if you choose not to (though it would be very appreciated). The way I see it, unless there is an extreme overhaul (And I mean extreme), you should pretty much be alright with a prototype, because if anything does change, it will be easily replaceable as the design is as such that anyone can mod it easily. Props to AcidFire for such a design. And I say this based on my experience of building the Ergodox by sourcing all the items myself rather than MassDrop. Can I send you a bag of switches to install in my beta? I can get behind a beta of this! Definitely in for a prototype and a final unit. Only thing I'm unsure of is what switches to put in the proto, can't be havin two boards with the same switches. Perhaps greens or blacks. Will it just be first come first serve to get the boards? From what I understand of indiegogo, yes, however I'll make sure that those of you on the boards are set up to get one, regardless of how indiegogo... goes. Wouldn't it just be easier to have everypony who is interested send you money directly? Honestly, using something like Indiegogo gives me a layer of organization that would take time away from development if I were to handle it all myself. However, if someone misses out, I will make sure you still get the opportunity to get a beta. Just incase my PM gets buried in your inbox, I just want to post it here. Though... how will you keep the public out? Or does it not matter? i am interested in this option. I have just set aside money specifically for this project so just let us know what you decide I have both pcb-mount and plate mount switches so im good on switches. I'm interested in a prototype too! Would you include a bluetooth "receiver" for devices that don't come with one? You can find one cheap online. Just look up bluetooth dongle on amazon or something. Seriously, you can get a cheap (in both senses of the word) one for under five bucks, or a halfway decent one for around twenty. No need to include it with the keyboard. Woah woah wait... The protos will come with bluetooth? I don't think it was ever explicitly stated either way, but it would make a lot of sense for testing. Bluetooth and leds are where I can forsee the most problems arising that could need hardware fixes. Unfortunately no, the bluetooth will not be included with these protos as there is a ton of work managing those connections alone, not to mention that the radios I'm looking at using are still fairly expensive in small lot quantities. There's also stuff to worry about charging & battery management as well. To answer the other question though, when I do make the add-on available, there will be an optional bluetooth dongle for PCs that don't otherwise have it. I'm also designing a base station that would allow both sides to be charged faster as well as include a bluetooth radio for them to connect to. Also, to elaborate a bit more on the bluetooth complications, to make the boards truely wireless (no cable joining them), each has to have a bluetooth radio. While Windows/OSX/Linux have no problem talking to multiple keyboards, mobile devices aren't as friendly. I know that iOS will only connect with one device type at a time, which means one half of the setup needs to slave to the other and still relay at a reasonable speed. I think that it might be a better solution to have just one side use bluetooth, and use something like a pair of RFM22 modules to let the two sides communicate. Thing is, unless I buy in massive quantities, a pair of RFM22 modules end up costing more than a single bluetooth radio, but that is an option I'm still looking at. I'm also looking at other alternatives for wireless as well, outside of bluetooth, however they wouldn't be as universal, especially with mobile devices. Honestly, lack of Bluetooth connectivity is hardly a deal-breaker for me. All of my current mechanical keyboards are wired, having a wired ErgoGP is fine. I'm more interested in the design and layout, can't wait to try it out for myself! Just thinking; maybe use a connecting cable for the L/R boards, and a single Bluetooth module for the PC connection? I know it wouldn't appeal to folks who want to mount these boards on the armrests of their gaming chairs, but it would make for a nice clean desk-top. I agree about the bluetooth. As for the cable, will it just be a standard TRRS cable like on the OG edox? If so, then for mounting it on chair arms for less movement('murica! ), you could just get a longer cable. This is entirely possible, and from a firmware point is a bit simpler to manage, since your just changing how your transmitting the information, directing it over BT instead of USB. This is where I was planning to start from and work from there. So I'm clear about it, I want to do the bluetooth option so that it's available for the Kickstarter campaign, so what I'm planning to do is start the development on it when the prototypes go out the door to you guys. Just like these boards, once I've got a working prototype that I'm satisfied with, I'll probably do something similar to what I have planned, and do a quick indiegogo campaign for the BT modules, again providing them at cost. wires is one of the things i freaking hate about my ergodox. i have been meaning to find a retractable TRRS cable. These are from the actual key, with the color tweaked a bit since the photos were slightly washed out when I took them. But those are (with maybe a slight exception to the red) color accurate to the LEDs. The one on the left was my second attempt with aligning to the center of the key. On the right was my first attempt, as well as my first (the circles) and second attempt (the patterning) at lasering the sides with a rig I designed to do it. the two top boards are just thumb clusters, so little to no development would be needed to add them to the mix And the pad at the bottom is a proper 10 key pad, however it's wide enough to fit a smartphone quite easily. the two top boards are just thumb clusters, so little to no development would be needed to add them to the mix :D And the pad at the bottom is a proper 10 key pad, however it's wide enough to fit a smartphone quite easily. Wow... that is one nice mountain of acrylic! Whoah, man! :eek: Step away from the fabricator, nice and slow... You're going off the deep end, there! I'm so in for a prototype - if there's still space. Happy to pay to help out. Yeah me too. Is there a way to know if we got on the list? Is there a list?